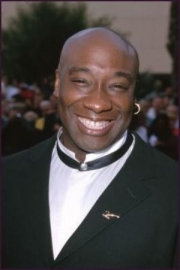 Michael Clarke Duncan is an American actor, best known for his breakout role as John Coffey in The Green Mile, for which he was nominated for an Academy Award and a Golden Globe. Duncan was born in Chicago, Illinois and grew up in a single-parent household with his sister, Judy, and mother, Jean Duncan , after his father left. He always wanted to act, but had to drop out of the Communications program at Alcorn State University to support his family when his mother became ill. Duncan's large frame—6 feet 5 inches and 315 pounds —helped him in his jobs digging ditches for the People's Gas Company and being a bouncer at different Chicago clubs. Duncan has stated that one of his many jobs had been a stripper and that his stage name was Black Caesar. In 1979, he participated in the Disco Demolition Night at Comiskey Park, home of the Chicago White Sox: he was among the first 100 people to run onto the field and he slid into third base. During the ensuing riot his silver belt buckle was stolen while he was stealing a baseball bat from the dugout. Clarke would later provide the narration for the 2005 World Series film. Duncan took other security jobs while in Los Angeles while trying to get some acting work in commercials. During this time, he worked as a bodyguard for celebrities like Will Smith, Martin Lawrence, Jamie Foxx, LL Cool J, and The Notorious B.I.G. all the while doing bit parts in television and films. When the Notorious B.I.G. was killed in 1997, a friend was covering for Duncan. This was the reason for Duncan to quit this line of work. In 1998, Duncan was cast as Bear in the film Armageddon, where he struck up a friendship with castmate Bruce Willis. It was Bruce Willis' influence that helped him to get his breakout role as John Coffey in the Frank Darabont-directed The Green Mile, a role which netted him an Academy Award nomination for Best Actor in a Supporting Role and a Golden Globe nomination for Best Performance by an Actor in a Supporting Role in a Motion Picture. Duncan then was cast in a string of films that helped to establish him as a star: The Whole Nine Yards, Planet of the Apes, The Scorpion King , The Island and Daredevil as Wilson Fisk, aka The Kingpin. Wilson Fisk is, by appearance, an overweight corporate head that takes the name Kingpin, but in fact he is the sole person running organized crime. Duncan signed on for the role in January 2002, though he had been attached far earlier. When Duncan was cast, he weighed 290 pounds. He was asked to gain 40 pounds for the role in order to fit the physique of Kingpin. In order to do this, he would lift weights for 30 minutes a day, and power-lifted with one or two reps a day, as well as eating whatever he wanted. Despite this, Duncan's biggest concern was that he is black, whilst Kingpin has always been portrayed as white. He spoke on the fan's loyalty to the source material by saying "they watch movies to say, 'Hey, that's not like the comic book.' But I want them to get past that and just see the movie for what it is and see me for what I am—an actor." In July 2006, Duncan showed interest in returning for the role of the Kingpin, but stated that he would not be willing to gain weight as he felt "comfortable" being down to 270 pounds. However, he jokingly showed willingness to change his mind if he was offered $20 million. Duncan suggested that the character be portrayed as having been training a lot in jail in order to become faster in combat against Daredevil, also working as a way to fit his weight loss into the story. Duncan has also provided his voice for a number of roles including Brother Bear and its sequel, Brother Bear 2, The Land Before Time XI: Invasion of the Tinysauruses, Quiznos commercials, and the video games Demon Stone, SOCOM II: U.S. Navy SEALs, The Suffering: Ties That Bind, Saints Row, and Soldier of Fortune, with his most recent role being God of War II, where he provides the voice of Atlas, the Titan condemned by Zeus to stand at the western edge of the earth and hold up the sky on his shoulders. He reprised his role as the Kingpin in Spider-Man: The New Animated Series. In 2005, he starred in the film Sin City as Manute, a powerful mobster. Duncan appeared in a minor role in the 2006 movie Talladega Nights: The Ballad of Ricky Bobby as Lucius Washington, and he voiced the role of the villain Massive in the Loonatics Unleashed. In 2006, he voiced the role of Numbuh 26 in the animated movie Codename: Kids Next Door: Operation ZERO. He played Balrog in Street Fighter: The Legend of Chun-Li and voiced the prison commander in Kung Fu Panda. He has also guest starred in numerous television shows. He appeared in an episode of The Suite Life of Zack and Cody "Benchwarmers" as Zack's basketball coach, Coach Little (Which Zack poked fun at, since the "Little" was somewhat ironic due to his large build). In 2005, Duncan guest-starred in a first-season episode of CSI: NY. He appeared as "Colt" in the second-season premiere of Chuck, "Chuck Versus The First Date". In November he appeared as a guest star on the CBS show Two and a Half Men. In April 2011 Duncan guest starred on an episode of Bones as Leo Knox. Whole or part of the information contained in this card come from the Wikipedia article "Michael Clarke Duncan", licensed under CC-BY-SA full list of contributors here.